Good Morning, Quilters and Quilt-Lovers! 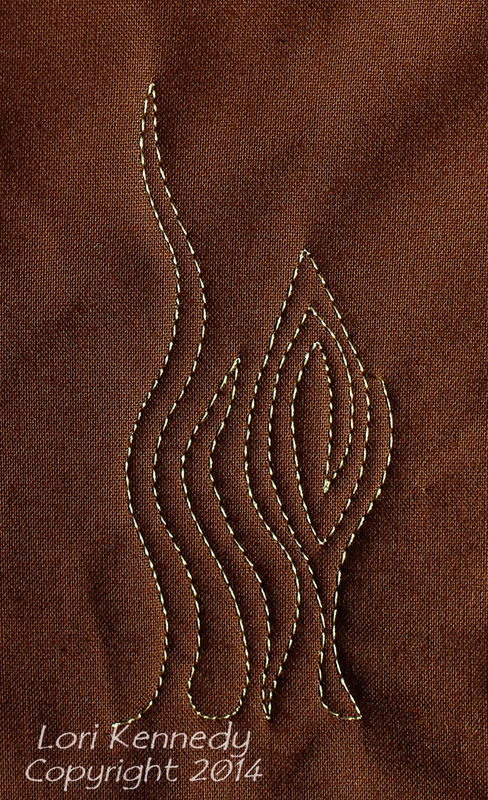 Today’s tutorial: Woodgrain is a motif I saw while reviewing a book for Molly Hanson of SewWrongSewRight. Molly’s book, Free Motion Quilting for Beginners (and those who think they can’t) will be released very soon. Begin by drawing a few straight lines. The lines will serve as a reference to keep motif relatively straight. 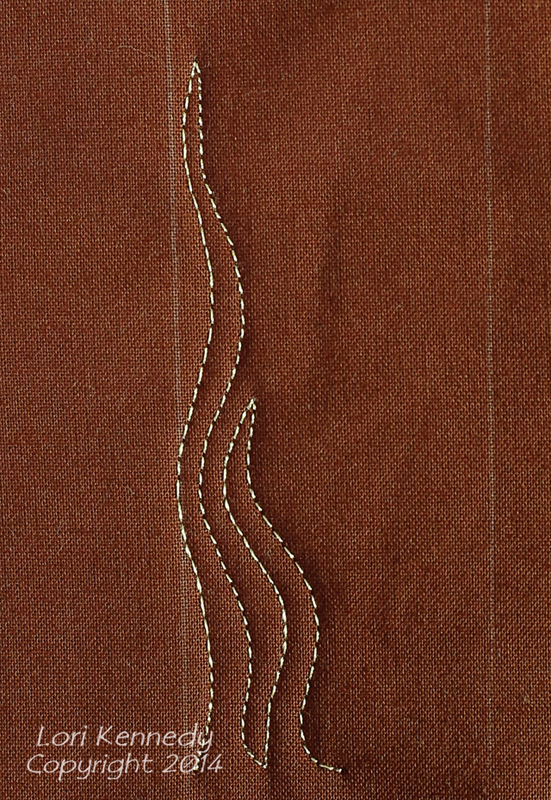 Start at the bottom of the quilt and stitch a wavy line. Echo stitch back down. 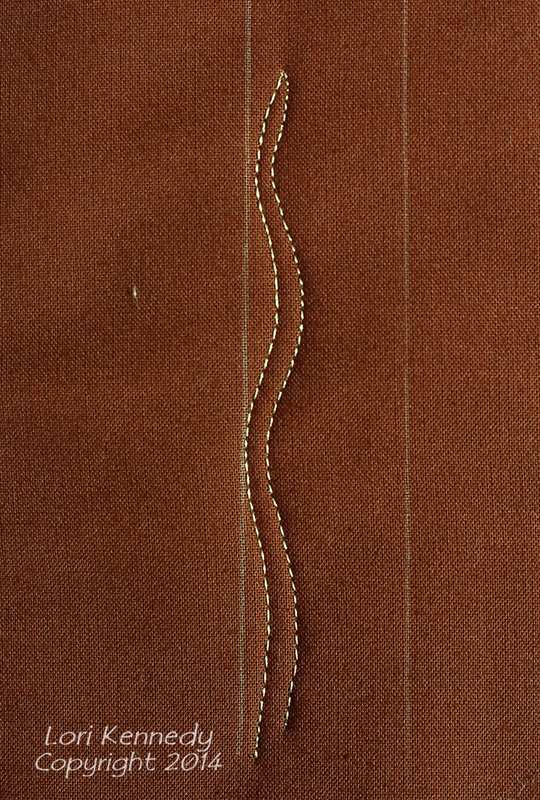 Stitch another wavy line, shorter or longer than the previous line of stitching. Echo back to the bottom. NOTE: Avoid ending the wavy lines at the same height. This looks unnatural. After adding several lines add a “knot”. 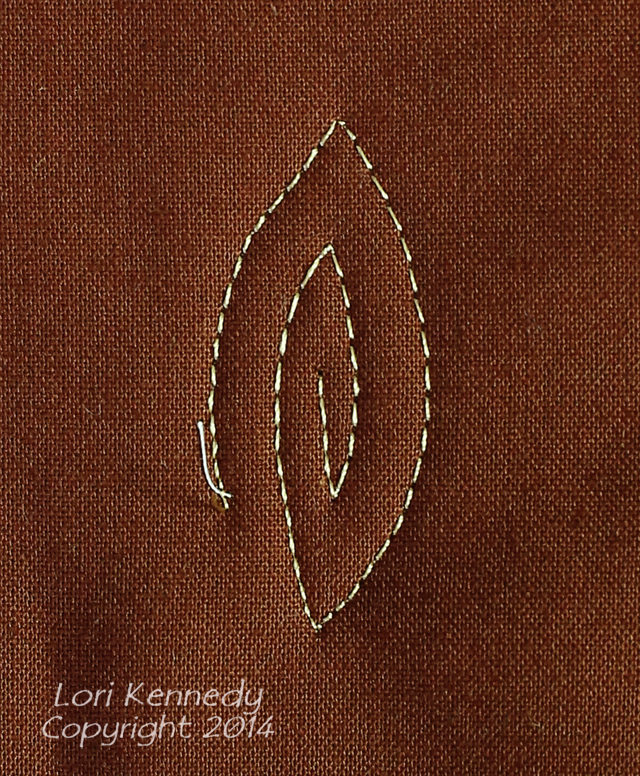 Instead of echo quilting, add a pointy spiral. Spiral in, then spiral out again. 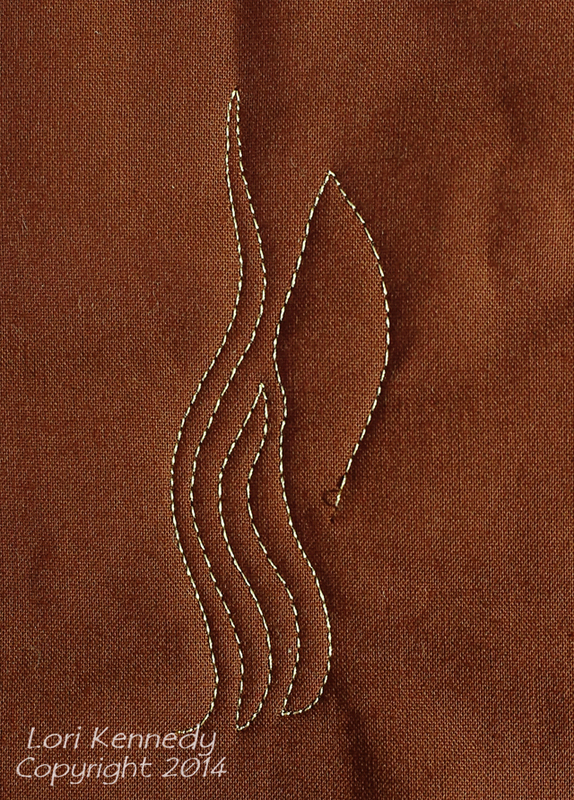 After stitch the spiral, stitch to the bottom line and begin adding echo lines again. Continue this way from left to right until the width of the quilt is stitched. 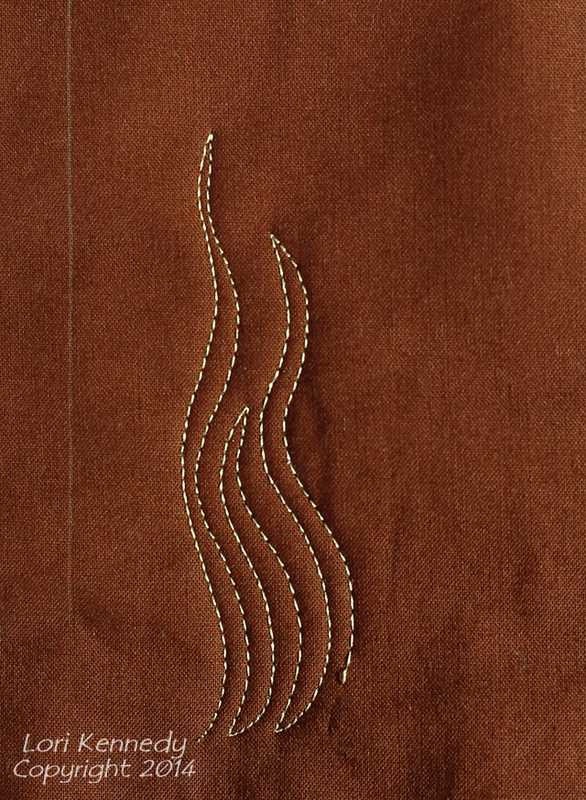 Then begin stitching back to fill in the area above the first set of stitches. This is a very forgiving motif. The lines are very irregular and mistakes are easily hidden-just like in nature. 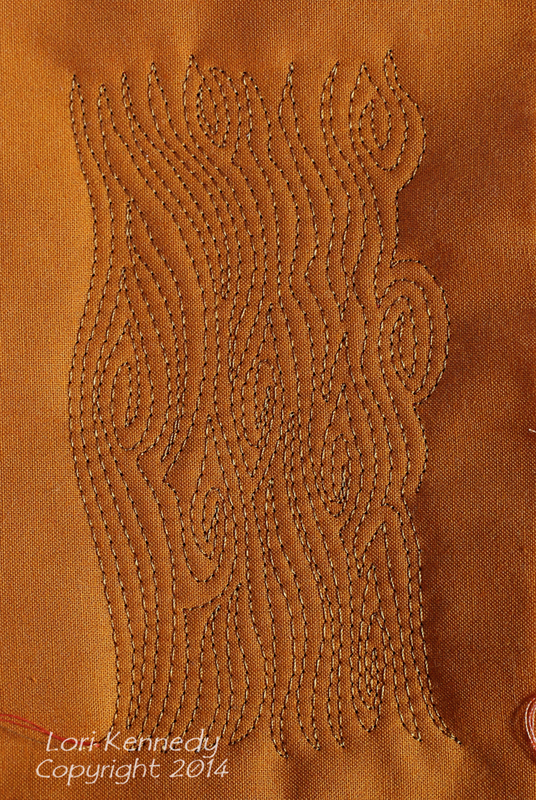 I have a project I stitched with Wood grain that was inspired by a project in Molly Hanson’s new book. A book review and a GIVEAWAY. PS…All tutorials, information and images are the property of Lori Kennedy at The Inbox Jaunt and are intended for personal use only. Feel free to share, Pin or re-blog with attribution to The Inbox Jaunt. For all other purposes, please contact me at lckennedy@hotmail.com. Thanks! oh that looks fabulous – might have to give it a try ! Endless ideas! Love this one. I send you a few mails but i think you did not receive them??? I send also an email with a picture of my first free motion quilt to your email adress. Did you already have time and inspiration for my fire fly question? If not i use the stars tutorial and otherwise a wait a little bit.. I did send you a response…I thought? Sorry. I love your darling quilt…Beautiful! Unfortunately, I’m not sure when I will be able to do the fire fly tutorial. It may be several weeks. (Lots of family time right now.) I would not wait for it…Or better yet…see if YOU can modify the bee to become a fire fly and show US how YOU did it!? No i did not receive a mail. I love this motif! It looks like something even I could do! Thank you for posting these tutorials. You make them all look so easy. I’ll be using your tute for woodgrain this afternoon. Thank you for the tute! You do such amazing work. Your explanations make me believe i can do it. Sincerely, Paula K.
Love it! a very gorgiving design as you said! I will use the wood grain a lot…it’s so pretty. Thanks!! Me, too, Ness … being a SD rancher I would be interested in seeing your inspired wire accident ;). Like you, when I see someone else doing it, it clicks and I wonder why I hadn’t thought of it. I was working out a chicken wire design on paper the other day – haven’t taken it to fabric yet. Because of the very geometric shape and having to keep the size consistent, I am still figuring out the most efficient placement of the guide rails. I want to see that coiled rope, too. Perfect timing of the “Wood” design. I am making a hunting quilt top for my grandson, this wood (no pun intended HEHEHE) be great for me to use. I enjoy your inspirations and visions everyday. I am not sure how to post a picture to your blog. Please advise. Very cool! Your quilting is amazing! Wonderful pattern! I have a question- do you tie off each time you stop a line or do you just back stitch? Love the woodgrain in a background. You make it look so natural! Great motif! Thanks for the tutorial. Perfect timing, I just started a “bookcase quilt” for a friend and this will be perfect place to start learning to “quilt” as so far I am a “piecer”. I love to do artful piecing but for some reason the quilting part scares me to death. Maybe it’s just old age LOL but I think you can teach an old dog new tricks. You have a “gift” for teaching, so glad I found your blog…. You just make this fmq thing look so easy. I will definitely be trying the wood grain look. Thank you for all of your great ideas! Thank you, Debbie. i just love to hear you are using the motifs. If you can, would you post to our Flickr group? I absolutely love your FMQ designs! Everyday you inspire me with a fantastic new idea. I know that you have intended your sharing of FMQ designs to be given free, but I wish that there was some way to keep a reference of your creations. Have you ever considered a book or binder of your wonderful sewing!? Your Saturday series makes me feel that I am happily taking a college class on important artists! Hi Priscilla, Thank you for your kind words. A book is in the works! It is a slow process, but it will be worth the wait! first time visitor ….loved your woodgraining, never would have thought of that. Think I’ll be following and waiting for your book. Thank you for this tutorial. This is perfect for a current quilt I am working on. It has wooden doors and I could not figure out how to sew/draw this on to them. Thank you again. Pingback: Need wood grain on your quilt? Pingback: Module 6: Free Choice Item | Stitch.Fray.Burn.